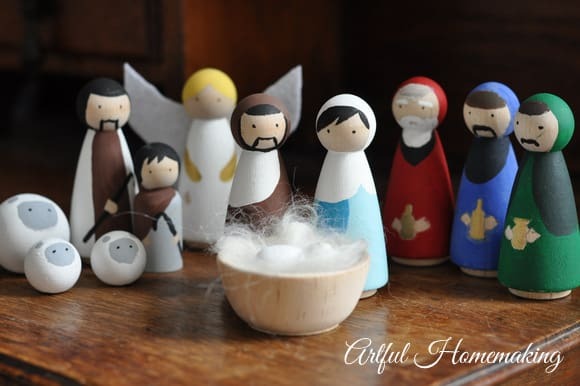 Our handmade wooden nativity set is my favorite. Just because it was handmade by us. It may not be the most beautiful, and the painting isn’t perfect, but it’s beautiful to me. There’s something about handmade Christmas ornaments and handmade Christmas gifts that are just so much more special to me. 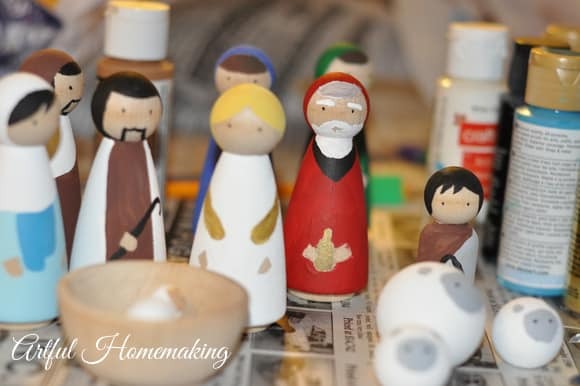 Making things together at Christmastime is one of our cherished family traditions. 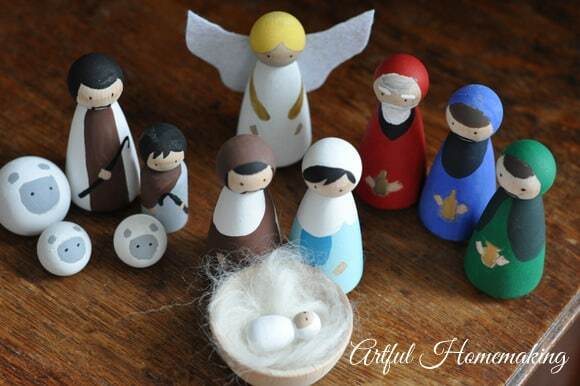 When I see it, I remember the sweet time painting the figures with my daughter. I love that we have this memory of painting these together. 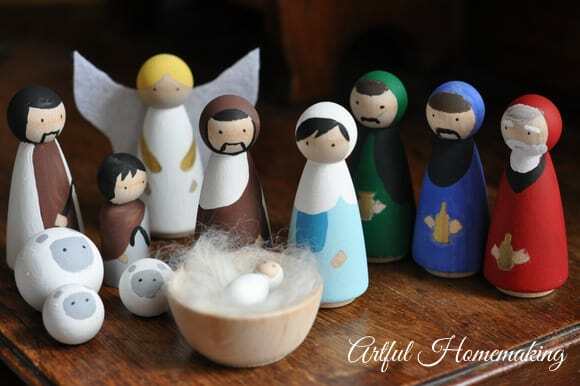 I also love that this nativity set, since it’s made with natural wood, is more durable and I can let the kids play with it. We had never made anything like this before, so it was a new experience for us. 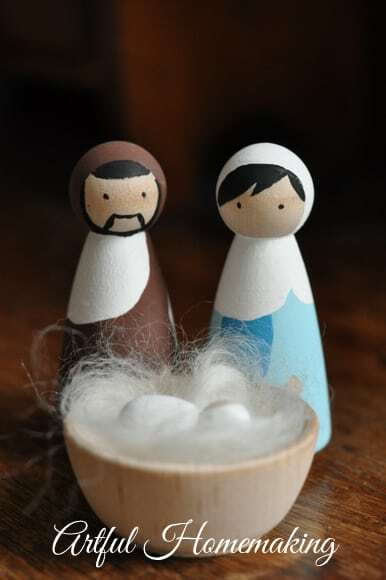 I had seen a picture of someone else’s hand-painted nativity set, and I modeled my figures after the inspiration photo. We did a few things differently, and painted a few of the details in our own way. We didn’t worry about perfection, we just did our best and had fun. 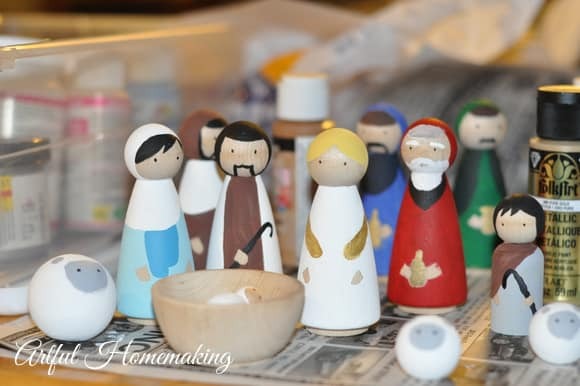 Our figures didn’t turn out perfectly, but they did turn out much better than I had anticipated! It always helps to not expect perfection. 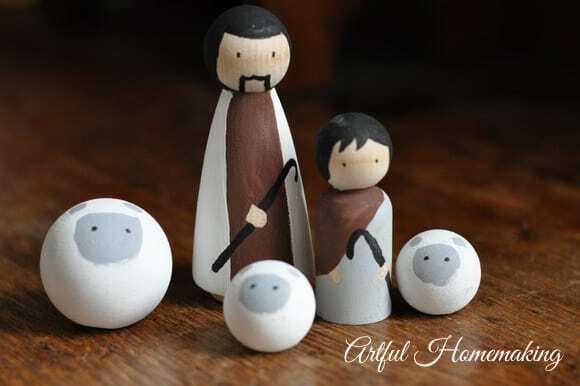 We just looked at our inspiration photo of the handmade wooden nativity set and painted our wood figures accordingly. It was actually fairly simple! The baby’s eyes didn’t turn out the way I had hoped (the paintbrush I was using had a stray hair and it kind of smudged one of them!) but that’s okay. 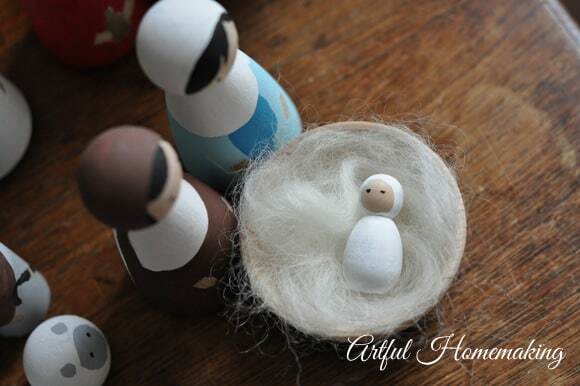 I used some wool roving (left over from another project) to line the “manger” with. 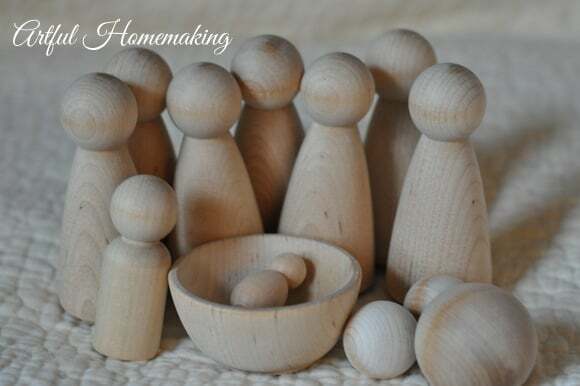 The wooden balls did need to be sanded on the bottom to make a smooth surface so they would stand up without rolling off the table! 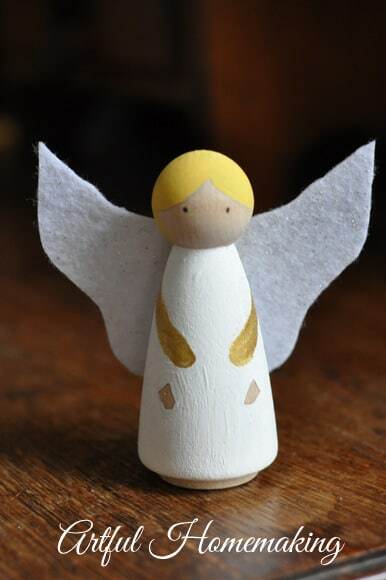 We hot-glued sparkly white felt wings to the back of the angel. WOW!!!! This looks absolutely perfect to me! I love it. It’s gorgeous. I liked your way of art and creativity. 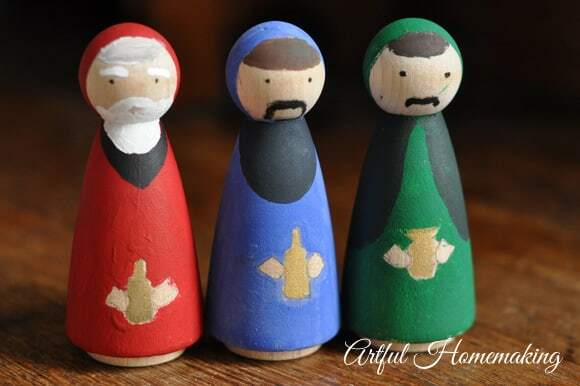 All are such a wonderful nativity set. 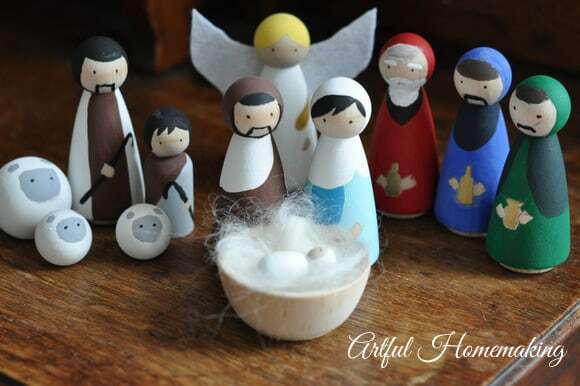 I will definitely try to make such nativity in my home also. Oh, I love that! We made peg people for Chinese New Year one year… I'm sure I have leftover pegs around here somewhere… Hmm! They are darling! 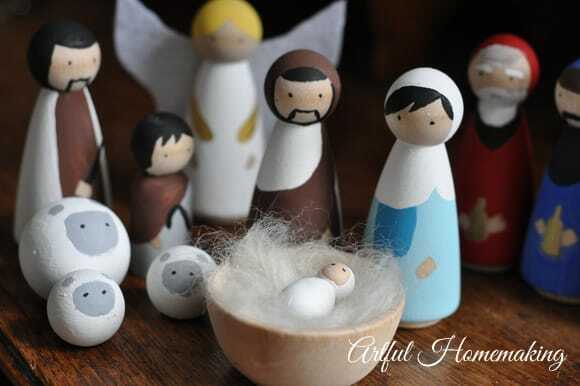 How fun and what sweet memories you made along with the nativity! I love them! They are so cute! Good job!! I LOVE IT!!!! Now I want to do this! They are absolutely beautiful!